Every now and then, those of us who are lucky enough to own toilet seats may feel the need to change them. Personally, I have a faible for wooden seats, for that warm, ‘close to nature’ feeling. Of course, a toilet seat has nothing at all to do with nature: there are few things less natural than a toilet, and even where there are toilets, there are not necessarily seats. Indeed, a toilet with a seat could be seen as the least natural variant of this most useful of devices: animals do not sit under the relevant circumstances, and nor have most people in most places and times. 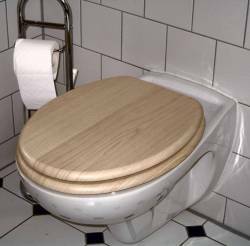 Many designs of toilet make do without a seat, providing footpads instead: the natural posture of the concentrating human being is squatting, with no seat in sight. The euphemism used in the Old Testament is therefore ‘to cover ones feet’ as in 1 Samuel 24:3 : “…there was a cave, and Saul went in to cover his feet,” because if you squat while wearing long loose robes, then they flop over your feet. There is a nice anecdote in Carlo Levi’s book Christo s’è fermato a Eboli in which some Italian immigrants to the United States, recent arrivals from the back of beyond in southern Italy, go out into the country for the first time since emigrating. The first thing they do on arrival in the fresh air and greenery is to pull their trousers down and squat under a tree, as they used to do at home: it was so much more satisfying than in the sterile artificiality of a modern bathroom with its porcelain and seats, and no gentle breeze. Those egregious predecessors of the Italians, the Romans, used to sit down, but in the public toilets at least, they did it in shared facilities, not in private cubicles. Beneath them, flowing water removed the debris. This was only practicable given the excellent water supply with which the Romans were in the habit of providing themselves. It all must have been rather expensive. Indeed, the author of the phrase pecunia non olet : ‘money doesn’t stink’ was a Roman emperor who put a tax on toilets. Presumably the slaves out in the countryside did not use toilets, public, private, taxed, smelly or otherwise, but dealt with things the same way as the 20th century peasants that Levi described a couple of millenia later. Of course, one of the advantages the Italians have over the Greeks is that they do not have much of a tendency to confuse themselves with the Ancient Romans, while the Greeks have a distressing tendency to speak and act as if they had some significant link with the people who lived in their neighbourhood a couple of thousand years ago, as we saw at the Athens Olympics. Be that all as it very well may, the old toilet seat needed replacing. It was made of wood, and it looked like wood, but the wood that it looked like was not the wood that it was: for reasons that escape my comprehension, it was constructed with synthetic wood pattern laminate on the outside of a wooden core. Its appearance was satisfactory, at least to a cursory inspection, and the seating warmth factor was also within an acceptable range. But our toilet is by no means the driest location within our dwelling facilities. It is not unknown for those availing themselves of it to push the large button provided on the wall above it for this very purpose in order to effect the flow of large quantities of water through it in a relatively short period of time and therefore at at some considerable speed. Under the turbulent conditions that then obtain in the bowl, it is inevitable that some splashing will ensue. In addition to this, out of consideration for the sensibilities of a high-status occupant of the house, the toilet lid is generally kept closed when the facilities are not in use. The humidity of the air immediately beneath the seat is therefore to a large extent influenced not by the humidity of the bathroom as a whole (which in and of itself is fairly high at times), but by the permanent presence of a pool of water only a few centimetres below it. Thus, the lower side of the seat is subjected almost continuously to a humid environment, and frequently also to splashing. 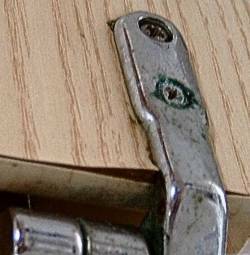 The result: the wood-effect laminate began to part company with the substrate and the hinges began to corrode. 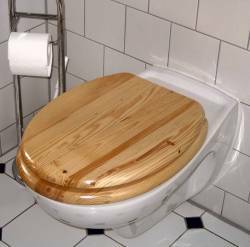 Buy a new solid wood toilet seat. Undo the screws holding the old seat to the toilet. 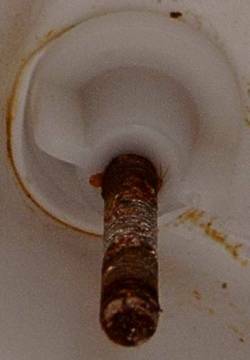 Remove the old toilet seat from the toilet. Put the new toilet seat in place on the toilet. 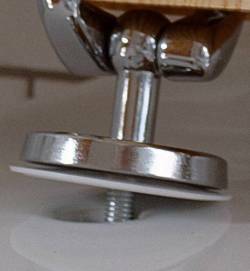 Screw up the screws to fix the new toilet seat to the toilet. 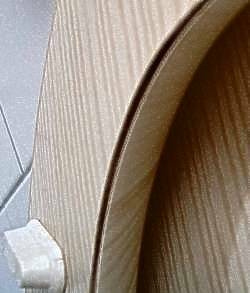 In this Vale of Tears things are seldom as simple as we imagine them, however, and the replacement of my old toilet seat turned out in the end to be a far more challenging task than I had at first imagined in my innocent naïveté. Making use of the fingers of my left hand, I removed the plastic nut from the screw on the left of the old seat. No serious challenges were encountered during the execution of this procedure. Encouraged by my success, and eager to build on it, I immediately addressed the corresponding nut on the right of the seat. It did not move. Tests indicated that a combination of grunting and low-level cursing effected simultaneously with attempted unscrewing actions did not increase the effectiveness of the same. 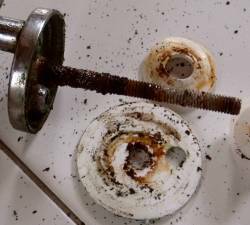 A visual inspection of the recalcitrant fixture revealed the presence of corrosion deposits of considerable thickness on the screw, which were blocking the downward rotatatory motion of the plastic nut. It was clear that no further significant progress could be attained by the application of digital torque alone. 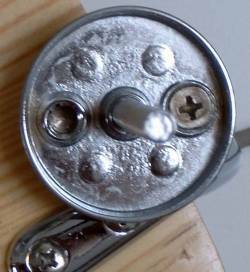 Calling on my several decades of experience in the field of Stuck Screws and Other Things That Won’t Budge, I decided to consider the use of a pair of pliers as a grasping aid, in order to apply greater torque to the immobilised nut. Due consideration then led to the conclusion that this would be an appropriate course of action, and a decision was taken to implement it immediately. The major obstacle to implementation of this far-sighted decision was the lack of any pair of pliers in the bathroom environment. This lack was the immediate consequence of an earlier strategic decision to store such tools as had no immediate function in normal body care in the shed rather than in the bathroom. Had a nail file been required, for example, this need could have been satisfied locally. As it was, a corporeal displacement was necessary. At this point the value of forward contingency planning became clear: although the possiblility that a pair of pliers located in the shed might at some future point in time be required in the bathroom had at no point been explicitly addressed while our house was in the design phase, the staircase that had nonetheless been provided for at that time revealed itself as ideally suited both to my shedward displacement whilst still bereft of the pliers and to my later bathroomward return equipped with them. Serious toilet-cleaning activity ensued, with no small degree of success. At this stage I believed, with what I believed to be good reason, that there was no reason to suspect that further execution of the project would proceed otherwise than according to plan. The toilet was clean and seatless. The new seat was mechanically sound and toiletless. All that remained was to bring the two together in such a way that each could benefit from the complementary strengths of the other. I felt that surely now, at this late stage, nothing could possibly pose a hindrance of any significance to the realisation of this purpose. But was my confidence justified? Would a dispassionate, disinterested observer in full possession of all relevant facts have endorsed my optimism? Or would he, she, or possibly it have indicated the appropriateness of a more nuanced attitude? Or perhaps of a more pessimistic, possibly even despairing state of mind? A factor speaking for cautious optimism was that the thoughtful manufacturers of the seat had provided screws for the very purpose at issue, to wit, the securing of the seat in an appropriate position on a lavatorial support. However, speaking against the optimistic view was a series of experiences of the assembly of various pieces of furniture, in the course of which, notwithstanding the provision of screws, nuts and other required hardware in sufficient quantities, and despite the prudent drilling of adequate numbers of holes in the wooden parts by suitable equipment in the factories of the suppliers, serious challenges in construction arose as a direct consequence of the failure on the part of the manufacturers to drill the holes in the different components of the construction in such positions as to possibilitate the juxtaposition of the said divers parts in a configuration in which a screw intended to traverse in a predetermined sequence a series of holes in a plurality of parts, with a view to securing the permanence of their mutual spatial relationships, could indeed pass through all holes implicated without the prior intervention of a series of serious to catastrophic breakdowns of a major subset of the laws of physics. A further point requiring consideration in the assessment of the situation was the interoperability factor: the seat and the toilet were from different manufacturers. 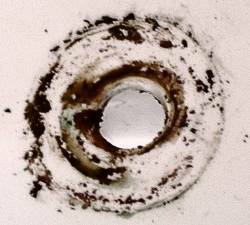 Were there relevant DIN or ISO standards to assure toilet-hole to seat-screw compatibility, and if so, had they been complied with to strict enough tolerances by both of the manufacturers concerned? In the light of this and of the above-mentioned considerations, my optimism was somewhat abated. It seemed to me, however, that in the situation obtaining, the time for theoretical considerations was past, and that bold, rigorously targetted action was required. It was nonetheless with some trepidation that I made the first attempt at placement of the seat. My apprehension proved ungrounded: the screws did indeed fit through the screw holes. Closer inspection of the screw mountings revealed indeed the possibility of significant adjustment of the positioning of the mounting screws in a horizontal sense, this arising from the eccentric positioning of the screw attaching the plate onto which was affixed the mounting screw to the hinges of the seat, of which possibility I availed myself in order to optimise the horizontal displacement of the vertical axes of the screws relative to the holes in the sense of achievement of maximum attainable centering. In the now obtaining advantageous situation created through successful insertion of appropriately adjusted fixing screws following on from the prior removal of the previous toilet seating arrangements as made possible by the not entirely unproblematic but then nonetheless with the aid of suitable equipment in the end successfully completed removal of the screws formerly attaching the said seating to the now newly seated toilet, the only task remaining was the placing under appropriate tension of the newly positioned fixing screws through the agency of plastic wing nuts (provided, like the screws, along with the new seat in a plastic bag included in the outer packaging within which the seat was supplied), said nuts now requiring the insertion of the bottom extremity of the screws into the orifice at their centre followed by the carrying out of a number of rotations in a clockwise direction as seen looking up from the underneath of the toilet (or anti-clockwise as seen from above) around a vertical axis passing through the centre of the said orifice, which number of rotations was required to be sufficient as to lead to a close juxtaposition of the wing nut with the lower surface of the lavatory such as to put a previously placed rubber washer, its central orifice equally transfixed by the fixing screw, under a considerable degree of pressure, leading to its elastic deformation to a degree at which the pressure transmitted by it to the lower side of the toilet in the immediate vicinity of the screw hole would be sufficient to lead to adequate frictional forces such as to hold the washer, and thus the nut, in close contact with it and the screw passing through the nut, in a constant position under the influence of the forces to be expected to be exerted on the various aforementioned components under circumstances of normal use of the toilet and of its seat, this number of rotations and the resulting upward displacement of the nut also being sufficient, given the obstacles to said upward displacement at the upper side of the nut, to lead to elastic deformation of the nut and of the screw thread on the inside of its central orifice such as to exert a downward force on the fixing screw of sufficient magnitude as when further transmitted through the upper screw fixing plate to the plastic washer also previously placed in position around the said screw prior to insertion of that screw in the screw hole to lead to a level of pressure adequate to cause frictional forces between this second washer and the upper side of the toilet in the immediate vicinity of the screw hole of a magnitude sufficient to hold the washer, and thus the plate in close contact with it and the toilet seat attached to the plate, in a constant position relative to the upper surface of the toilet when subjected to such forces as might arise and be passed on to it and the other aforementioned components from the toilet seat under normal use of the same, which said number of rotations however being insufficient as to place the thread on the inner surface of the central orifice of the nut under such forces as to lead to mechanical failure of its material and plastic deformation of its structure with an ensuing loss of function, which insertion and rotation I now carried out, it proving appropriate to effect the later rotational steps with the assistance of the pliers earlier used for removal of the corroded screw affixing the previous seat to the toilet, these later rotational steps representing the final stage of the realisation of the above-sketched plan to effect the exchange of the no longer adequate old toilet seat for a newer and better one. The use of the replaced seat is outside the scope of this documentation.